Lebo’s city hall is where the action is! City employees work throughout the day Monday through Friday 8:00 a.m./4:30 p.m. (or whenever something needs attention) to make available various services to the citizens of Lebo and the Lebo area. 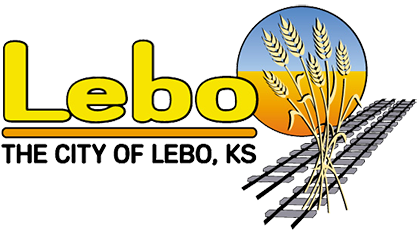 Lebo is a city of the “Third” class with a Mayor/Council form of government. Actually, we view ourselves as a “first” class city but, state statutes that Govern the make-up and powers of city governments in Kansas divides cities into three classes according to population. I am sure there was no slight intended. Please click the link above for more information. The City Clerks office, located in City Hall is your first point of contact for city services and information. Please write, call or E-mail with your questions or requests. We will be happy to help! Water, Gas and Street Dept. The Utility crew keeps your water, gas and sewer systems working and performs regular maintenance to keep the systems in good shape. The Utility crew is a multi-discipline group that also maintains the roads and drainage as well as the city parks. If you need to contact the crew, please call City Hall during business hours. Lebo law enforcement officials work to make our community a safe place to live and work. In the event of an emergency, please call 911. For routine business or just to say, “job well done”, the Lebo Police Dept. number is listed below. When you call 911, you reach the Coffey County Sheriff Department. The Sheriff’s dispatcher will then immediately contact local law enforcement AND other emergency personnel such as Fire or Emergency Medical Response teams, as needed. If local law enforcement is unavailable, a Sheriff Deputy will be dispatched. Local law enforcement as well as other emergency personnel are in constant radio contact with the Sheriff Dispatcher. Calling the local law enforcement office phone may waste valuable time in an emergency.